A successful 18 month general assembly for the Sylfeed project was held last week, on the 12th and 13th of February. The meeting was hosted by Arbiom in Paris. The meeting was a perfect opportunity for all partners to meet and review the project objectives and the work plan, with a short overview on each work package. Special focus was on actions launched during the first period and main achievements, along with deliverable and milestone status at this stage of the project. The first of the small-scale feeding trials has just started with the juvenile Atlantic Salmon trial. 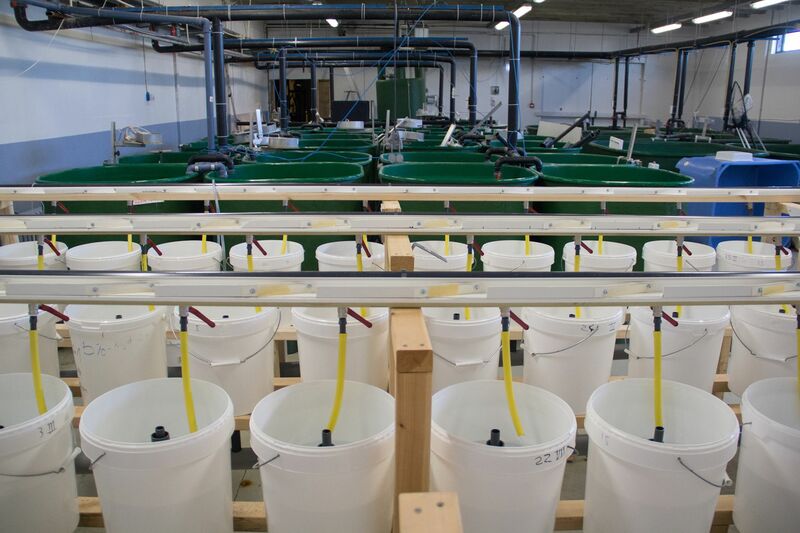 Juvenile Atlantic salmon have been chosen to assess the impact of Sylpro on growth shortly after first feeding of fish, when their growth rate is rapid and protein requirements high. 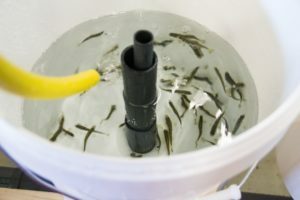 At the start of the experiment all fish were individually weighed with all tanks starting with equal numbers of fish and biomass. At the end of the trial all individual fish will be weighed again to assess how growth performance varied across feed treatments. In November 2018 diets were formulated for the first trials of SYLFEED. This includes two small-scale trials, the first with juvenile Atlantic Salmon and the second with Nile Tilapia. The two species have very different nutritional requirements since Atlantic Salmon is a carnivorous species and Nile Tilapia is an omnivorous species so unique diets must be formulated for each. Matis has produced 10 feed treatments with various inclusion levels of SylPro replacing current protein sources used in commercial diets. Animal trials will start beginning of 2019. Rise Processum has successfully produced a few kilograms of SylPro, thus reaching a first milestone in the demonstration of the SYLFEED value chain from Wood to Fish feed. Wood residues (saw dust) were used for the production of SylPro according to Arbiom protocol. This material has been transferred to Matis in Iceland to perform compositional analysis. 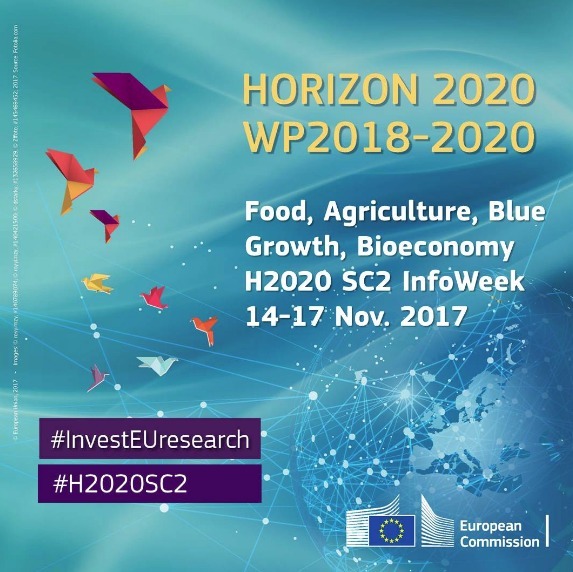 The event provided an overview of the wide cross-sectorial and interdisciplinary marine, maritime and aquatic research and innovation in Horizon 2020, and its relevance to EU policies, the Bioeconomy and the Blue Economy. As part of this event, Amélie Drouault, Partnerships Manager at Arbion presented the SYLFEED project, emphasizing on the project benefits & impacts on European economy. The Woodchem® 2017 Congress is an international scientific conference dedicated to wood-based chemistry. 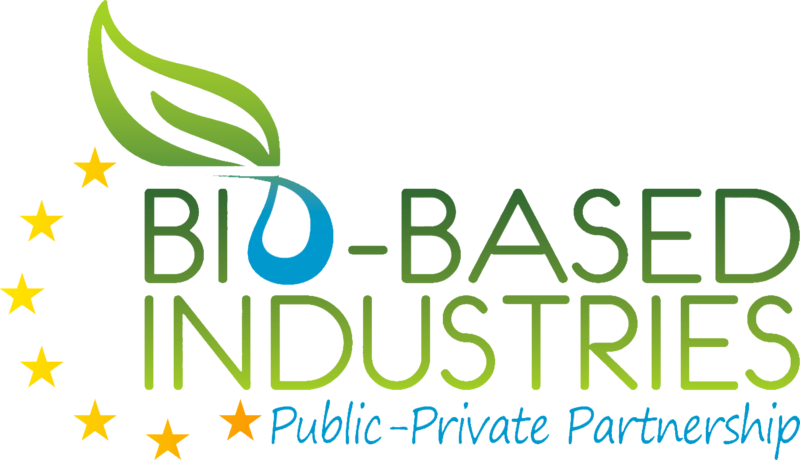 As part of this event, Dr. Lisette Tenlep, Senior Director of Research at Arbiom, will present the Sylfeed project and the latest improvements of the company to convert the wood into sustainable food/feed for aquaculture. Arbiom announced the launch of the SYLFEED project today which will demonstrate a new integrated « wood to food » value chain, providing both a sustainable solution to the global challenge of feed production and new economic development opportunities for biomass rich regions. Using Arbiom’s biomass fractionation technology, poorly valorized local hardwood material will be converted into sustainable, protein rich material to be used in aquaculture feed. The €10.9M EU in funding from the European union BBI-JU will support the building of a demonstration plant that will be co-located with Norske Skog Golbey’s pulp and paper site in the east of France. The SYLFEED project builds on years of development and collaboration between the partners, notably between ARBIOM and Norske Skog Golbey as part of BIOSKOG, an 18-month pre-study that received the support of the Region Grand Est and the European Regional Development Fund. 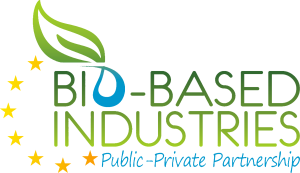 “The SYLFEED project puts a new spin on the bio-economy: ligno-cellulose is not only a sustainable solution for the chemicals and fuels industries, but now also present us with a scalable and sustainable solution to the world’s growing food sourcing problems in general and Europe’s protein deficit in particular,” said Marc Chevrel, CEO of Arbiom/Biométhodes. “The SYLFEED project continues the collaboration between Norske Skog Golbey and Arbiom. It utilizes woody biomass from forests in new markets and is the last step before the construction of a commercial plant at the Golbey site.”, said Yves Bailly, CEO of Norske Skog Golbey.